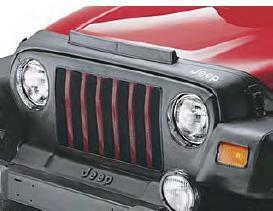 Front End Covers for the 97-06 TJ Wranglers help protect the vehicle from bugs, dirt and other road debris. Designed to securely fit the contours of the front end, this high quality cover features two-piece construction to allow the hood to be opened without removing the cover. Black vinyl material with 22-ounce foss polyester backing will not harm painted surfaces. Black, with Jeep logo. Please select Wrangler type above. Item # 82204177AB - For Wrangler with painted wheel flares. Rubicon model. The hood cover is great!! The grill guard we couldn't use as we have the wider fender flares on the jeep and it wouldn't align correctly. :0( I was really hope to be able to use it! But we love the bra for the hood!! ConsDescription of grill cover might add that it's for the narrower wheel flares... just a thought (we have rthe wider flares and it looked "funky" and didn't align well.